The food product contains undeclared gluten. Icelandic Holdings Ltd has recalled its Sun Valley Foods Granny’s Treat Mix as it contains undeclared gluten. 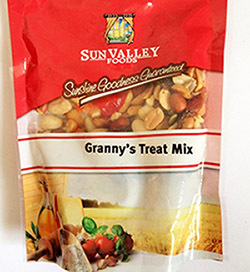 Sun Valley Foods Granny’s Treat Mix is a fruit and nut mix snack food sold in a 300g resealable plastic pouch. All dates and batches are affected. The product is sold in FreshChoice and Four Square supermarkets throughout the South Island. People with a gluten allergy or intolerance should not consume this product. If you have consumed this product and have any concerns about your health, seek medical advice. If you are not allergic or intolerant to gluten, this recall does not affect you. Return the product to your retailer for a full refund. For more information, contact Icelandic Holdings Ltd on 09 571 0033.